Education Packages –are delivered to schools in the local area and have become an integral part of the curriculum. 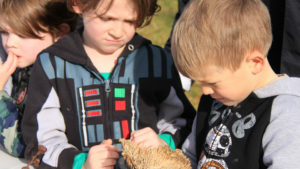 The education day packages are co-ordinated by Landcare. We have several alternatives for delivery. Groups of students rotate through sessions being conducted by an assortment of presenters from the Landcare, GBCMA, CMN‘s, the Department of Sustainability and EnvironmentAg Vic, Goulburn Murray Water, Parks Victoria, Shire representatives; other environmental groups, local historians and the local Indigenous education officers and anyone else who is passionate inough to want to participate. The packages are a generic set of activities designed and planned with teachers to fulfil part of the curriculum, not just a one-off day activity.